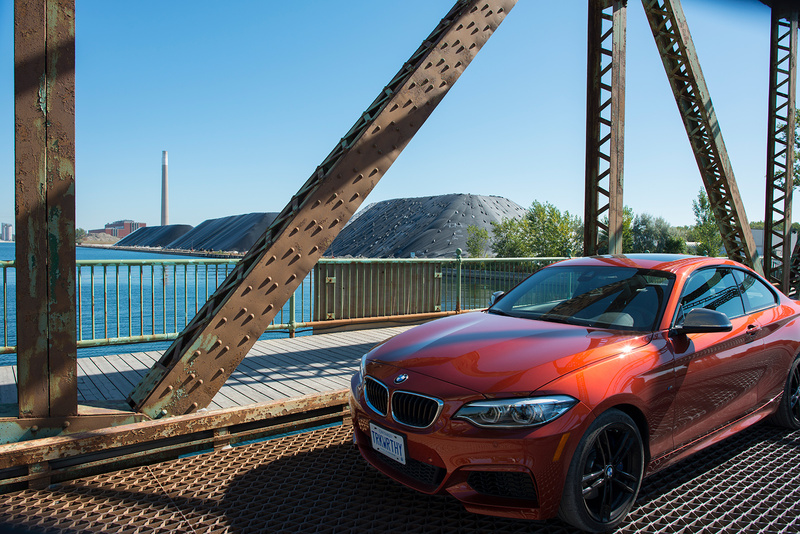 If you’re looking for a compact performance car that will get you noticed, a Sunset Orange Metallic 2018 BMW M240i is a great place to start. 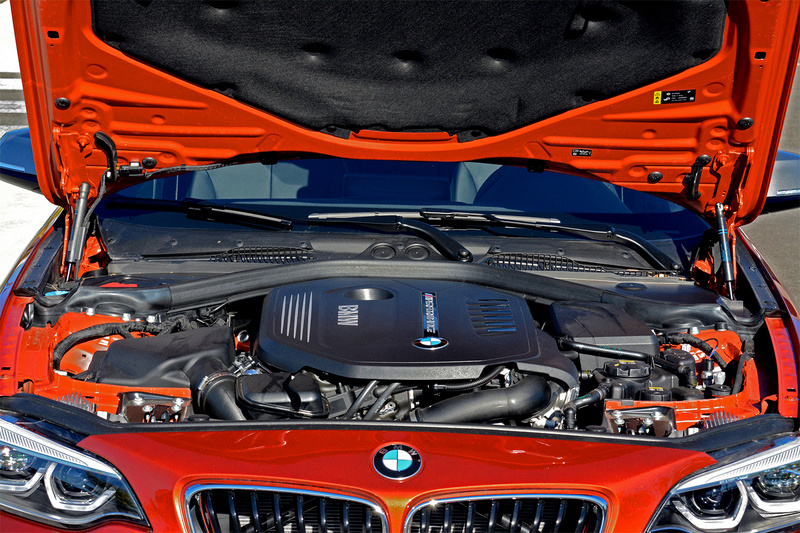 The M240i exudes quality, refined German engineering and performance, lots of performance. One of the features that makes this car so much fun to drive is the abundance of torque available to your right foot. The 3.0 litre twin-scroll turbocharged direct injection inline 6-cylinder engine pumps out 369 lb-ft of torque and 340 hp, up 5 hp from 2017. 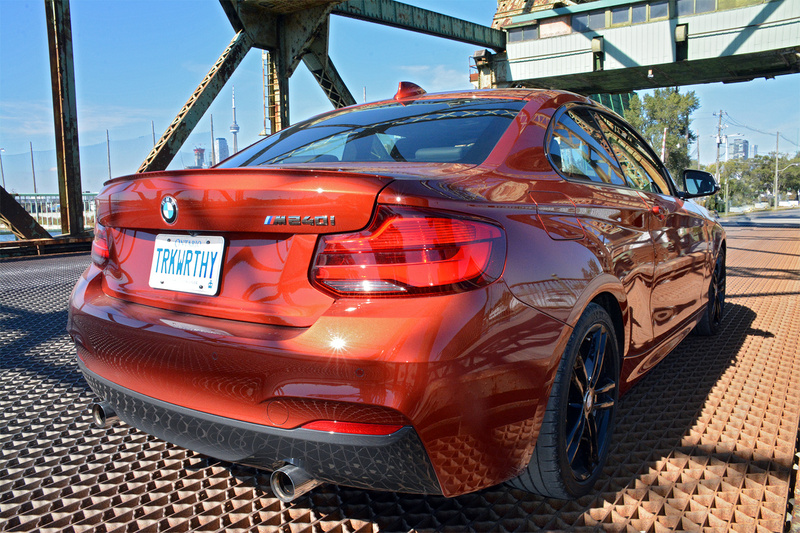 We were fortunate to be driving an M240i equipped with a silky smooth 6-speed manual transmission. With all of that torque available throughout the rev range, from 1,520-4,500 rpm, driving around town requires very few gear changes because the engine won’t complain when lugged around at just above idle. It is interesting to note that the 6-speed manual is only available in the rear-wheel drive model. 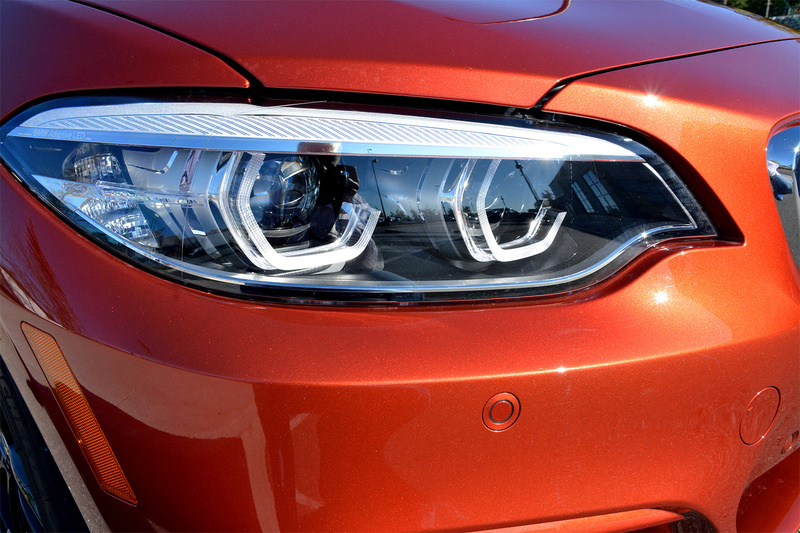 You must take the 8-speed Steptronic Sport automatic transmission if you want all four of your wheels driven through BMW’s xDrive all-wheel drive. One thing we weren’t too fond of was the auto rev-matching feature which cannot be turned off. When gearing down, you don’t need to heel and toe to blip the throttle, the auto rev-matching takes care of that for you. The most sobering thing about this feature is that with every single downshift, the system executes flawless rev-matching, much more precisely than we ever could. We would have loved to have been able to disable it, and get back to our own inconsistent heel and toeing, but that is not possible. You can still heel and toe if you want, just know that the on-board computers are working their magic for you. And just for the fun of it, try the ECO PRO mode. With the push of a button you instantly lose all of the car’s get up and go. It is as though you are transformed into the future where performance has been outlawed and we are all required to drive powerless eco-friendly commuter cars. Thankfully, you only have to try this once, just to experience it, then get it back into Comfort, Sport or Sport Plus mode and off you go! Our car was fitted with an M Performance exhaust, a $1,500 option, which really adds to the enthusiastic driving experience. If you’re going to choose a colour like Sunset Orange Metallic, which is an $895 option and new for 2018, you should deliver a correspondingly enthusiastic soundtrack. 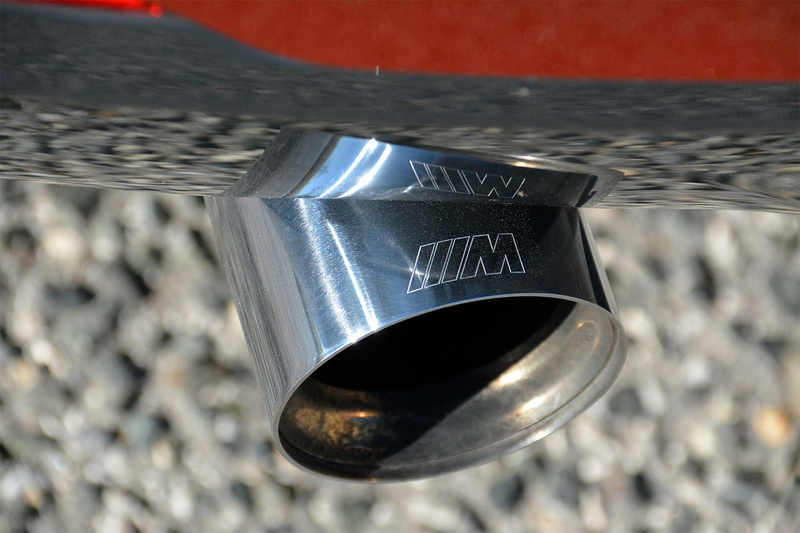 The M Performance exhaust delivers. To try to put all of that torque and horsepower to the pavement, our car was fitted with 18” jet black rims wrapped in 225/40/18 Michelin Pilot Super Sport tires up front and 245/35/18’s in the rear. When you switch to Sport Plus mode, traction control is turned off and the rear tires struggle to keep up. 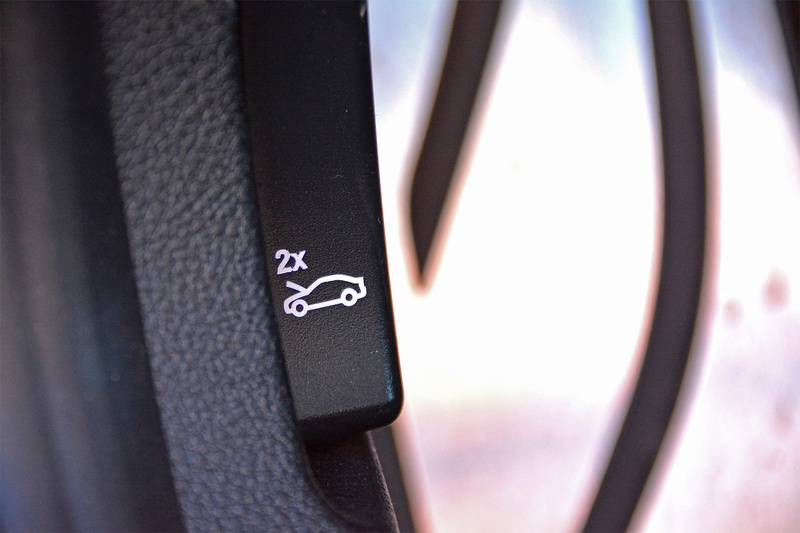 It is less of an issue on warm summer days but in colder wet weather, Sport mode with traction control on is a safer way to go. The 2018 BMW M240i has a completely redesigned instrument panel with a driver-focused layout. 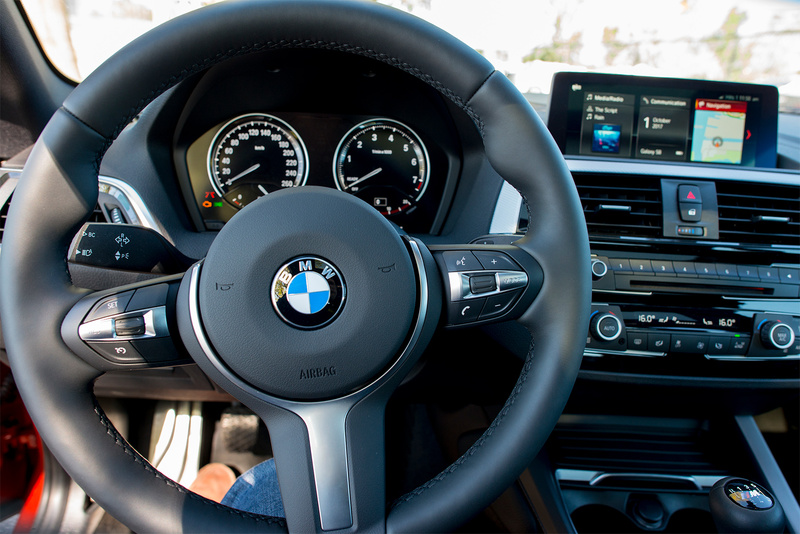 It comes with BMW’s latest iDrive 6.0 with standard 6.6” screen and 8.8” hi-res central touchscreen display. It doesn’t take long to familiarise yourself with the system and you can accomplish almost anything you want with relative speed and ease. One of the radio functions we like most is the ability to push just one button on the dash to cycle through AM, FM and satellite radio. You don’t have to dive into the iDrive for that. We also really like the optional wireless smartphone charging which is part of the Smartphone Connectivity Package, a $750 option. Our smartphone was equipped with wireless charging and as a result, it meant that we were never without the ability to charge our phone, no cables required. Just dock the phone in the wireless charger under the armrest and the phone instantly starts to charge. For phones not enabled with wireless charging, BMW offers a wireless charging adaptor. 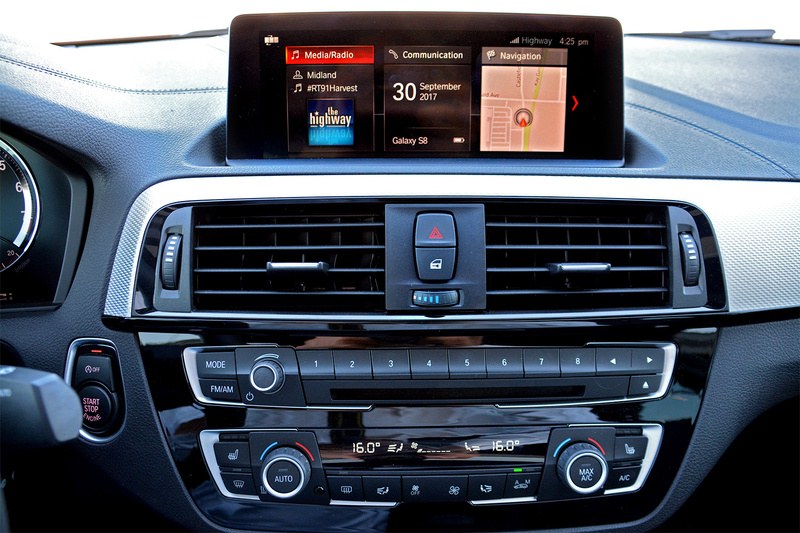 Also included in the Smartphone Connectivity Package is Apple CarPlay preparation and Wi-Fi hotspot. Once you spend time with a car equipped with wireless charging, you won’t want to be without it. It is a common reality in this fully automated world of ours, that manually shifting your way from 0-100 km/h is slower than letting an automatic transmission handle the gear changes for you. Such is the case with the 2018 M240i. The slowest accelerating iteration of this car is the 6-speed manual with rear-wheel drive which will accelerate from 0-100 km/h in 4.8; next fastest is the 8-speed Steptronic Sport automatic with rear-wheel drive which will run to 100 km/h in 4.6 seconds; and the fastest accelerating combination is the 8-speed auto and xDrive all-wheel drive which will hit 100 km/h in just 4.4 seconds. What didn’t we like about this 3,500 pound pocket rocket? First-world problems included the inability to sync the dual climate controls. You cannot sync the dual climate controls in the 2, 3 and 4 series BMW’s but you can in the 5, 6, and 7 series and all of the BMW SUV’s. This is most tedious in extreme temperature conditions. When it’s freezing outside in the winter or hot and humid in the summer, one would prefer maximum heating or maximum cooling, not one side of the car out of sync with the other. Every time you change the cabin temperature, you have to do it twice. Looking on the bright side, your right shoulder muscles will get an extra work out every time you adjust the interior temperature, twice. Also on our personal nitpicks list is the tall centre armrest. 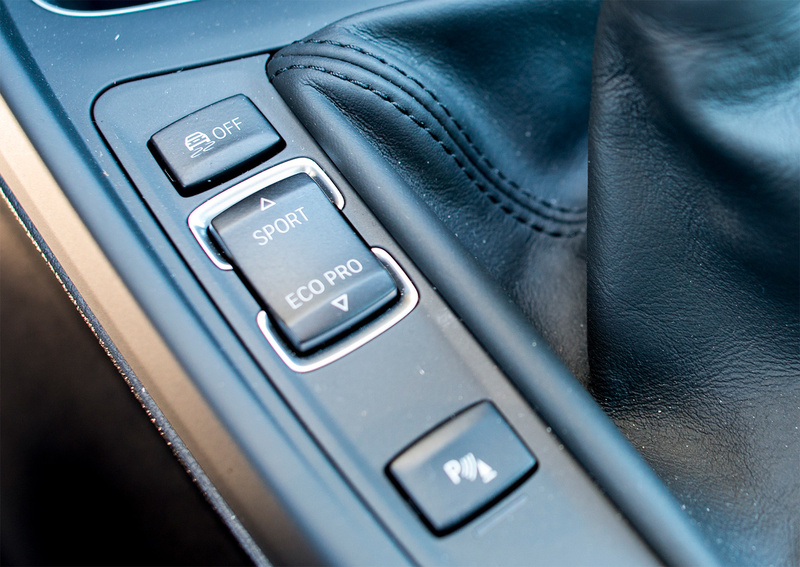 It is quite high and as a result, you have to shift gears gripping the top of the shifter rather than wrapping your hand around it from the side, but that might boil down to just our personal preference. We would have also loved to try the M240i with xDrive all-wheel drive mated to the 6-speed manual transmission, but that combination is not available. I guess we should be thankful that a manual is offered at all in this day and age, and we are very appreciative of that. Also, as previously mentioned, we would have loved to have been able to disengage the auto rev-matching. 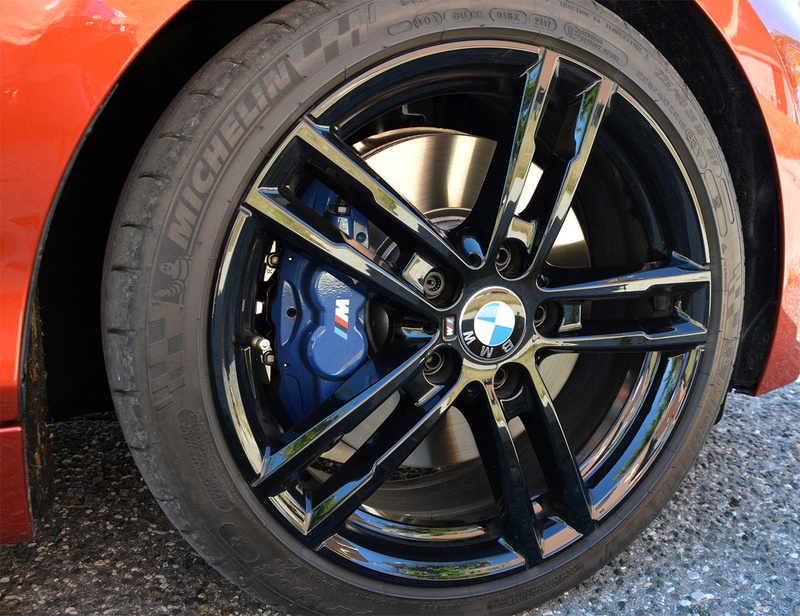 The shiny black rims are also surprisingly hard to keep clean, which surprised us. We took the car through a car wash and had to hand wash the wheels afterwards to try to make them look clean again. Dark grey wheels seem to be the easiest rims to keep clean. One would have thought that black would do a better job of hiding the brake dust and dirt, but it seems to do the opposite. But when the wheels are clean, they do a great job of complimenting the Sunset Orange metallic paint. Additional optional equipment on our car included the $4,950 Premium Package Enhanced with universal remote control, comfort access, glass sunroof, auto dimming exterior mirrors, lumbar support, front and rear park distance control, nav, SiriusXM satellite radio, Connected Drive Services Professional; $1,500 Driver Assistance Package with adaptive LED headlights, high beam assistant and driving assistant. Standalone options included the $1,000 Harmon Kardon sound system which had a nice sound, but the exhaust sounded better. The 2018 M240i comes standard with M Suspension and M Sport brakes, both of which really add to the driving dynamics of the car. The bottom line is that we would love to have this car parked in our driveway in any one of its 8 available colours, although we are now particularly fond of Sunset Orange. 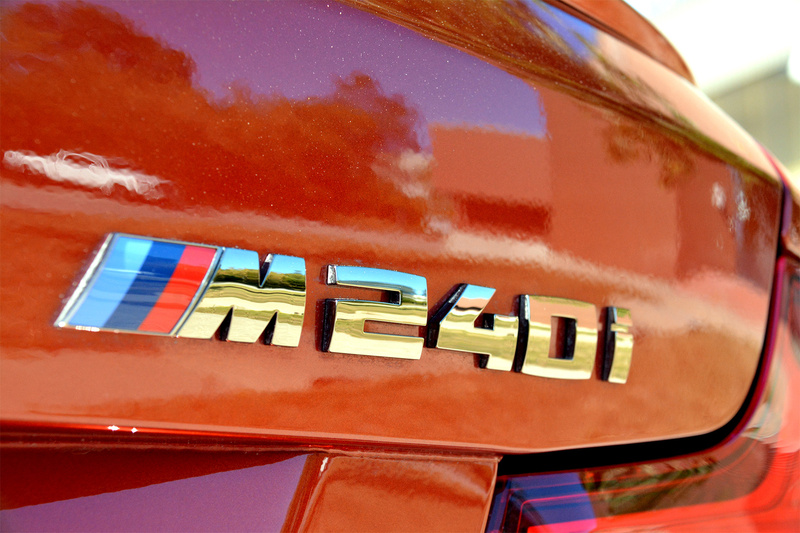 With a base price of $47,000, the M240i delivers a lot of enthusiastic performance bang for your buck. Our car was equipped with $10,200 in options, most of which we really liked, but once you get up to an MSRP of $57,200, it becomes slightly less of a performance bargain. Having said that, this is still a lot less expensive than the top of the line 2 series, the M2. 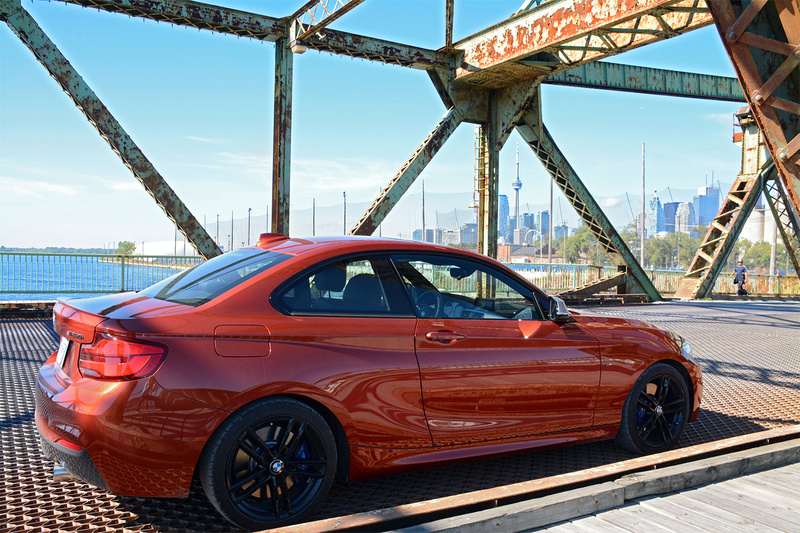 Yes, we know that the M2 is the Ultimate 2 series Driving Machine, but a comparably equipped 2017 M2 will set you back around $74,000 plus delivery, fees, taxes, etc. As much as we love the extra aggression of the M2, we would be very happy to have a 2018 M240i parked in our driveway. And with all of the money we would save buying the M240i over the M2, we could participate in lots of track days and go on long road trip vacations in this extremely capable and fun to drive 2-door coupe. PHOTOGRAPHS and VIDEOS © Copyright 2017 TrackWorthy Group Ltd.